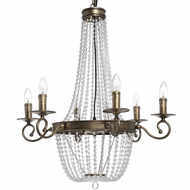 This six light chandelier is the height of elegance and is ideal for more formal dining or living rooms. 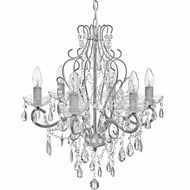 Its looping metalwork and glass teardrops that reflect the light from the bulbs will create a magnificent display for a dining or living room. 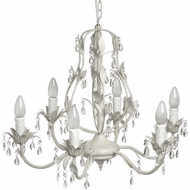 The bulbs appear to sprout from the arms of the chandelier like flowers. 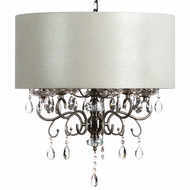 The chandelier is hung from a ceiling rosette by a chain.